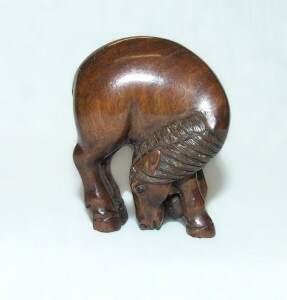 This netsuke Horse is a rare left hand version of the very famous original by Garaku, mid 18th century. In 1990 a version by Tomotada sold at Sothebys for a record $385,000 + premiums. This superb, signed example, shows beautiful patination from wear and handling. The Horse is the Seventh Sign of the Animal Zodiac and represents the 5th month as well as the hours between 11 a.m. and 1 p.m. Symbolizes endurance and strength and is a talisman for good luck in love affairs.